"This is Zoe (left), my Pug / Shih-Tzu cross (Pug-Zu) puppy at 10 weeks old with Koa (right), my Golden Retriever. They are shown here chilling out in the garden. The two girls have bonded and are the best of friends. Zoe has helped Koa come out of her shell, as she did not know how to be a puppy. 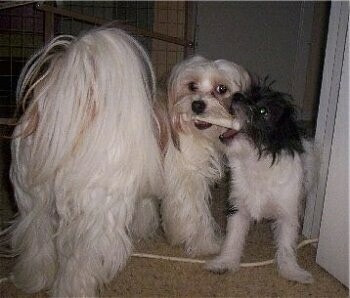 It is truly amazing watching a 2-pound puppy play and teach a 50-pound puppy...who would have thought?!!!! Zoe is a tough little princess and is a true mix of both breeds. Her little package is filled with tons of personality which is evolving every day. Zoe loves our 3 children and 2 cats and greets everyone with a true pug smile everywhere we go. Zoe loves to eat shoes and thanks to Zoe, Koa now thinks they are great fun...LOL...and digs huge holes in the garden, once again teaching Koa how to dig…g.r.e.a.t!!!! Nonetheless they are a priceless pair to watch." "We watch Cesar Millan all the time and think he is truly an inspiration for all pet owners. Koa, our Golden Retriever came from an abandoned litter after only 3 weeks and her littermates were separated at 5 weeks. Through obedience training with very specialized trainers and following Cesar's tips we have been able to train Koa and teach her so many of the things her mother and sibling would have done. But the most amazing changes came when we brought our little Zoe home. Koa is a well-balanced and obedient puppy, one to be very proud of. And thanks to all of our studying, Zoe will have the best start to her new life with us." 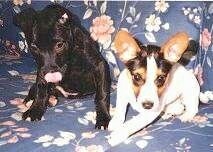 "Finnegan is on the left, he is the darker one. He is a one-year-old half English Mastiff and half Great Dane hybrid (Daniff). Beau is a two-year-old Harlequin Great Dane." Trigger the Dobe at 6 months old, with Sui, a Japanese Spitz mix and their owner. They reside in the Philippines. "Boone, a Coonhound / Pointer mix that keeps Crockett the Redbone Coonhound entertained." Bryaba Says Whatchamacallit, but he goes by "Shisma," a liver-nosed, red wheaten Rhodesian Ridgeback at 3 years old, with his roomate Neelix, a Yorkie. "Shisma and Neelix sleeping on the floor...the best friends are usually curled up together when asleep." Zoe (left) the female Lab / German Shepherd Dog mix at 7 months old with Ziggy the male Shar-Pei / Boerboel hybrid at 7 months—"They are beautiful, very well-behaved dogs. Ziggy is a bit stubborn, though and hates water." 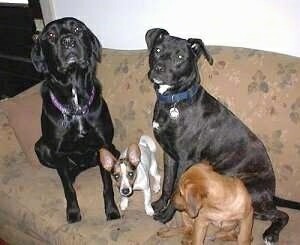 "This is our rescued pup Bailey the timid Jack-A-Bee with our Mini-Schnauzer Pippers. The two are best friends even though they only met recently."